GCaptain is a top-visited maritime and offshore industry news site and this post attracted me – first because of the name and then because of the news…….. before you read the post, some prelude. Liberia is in West Africa bordered by Sierra Leone, Guinea and Ivory Coast to its east. It covers an area of 111,369 square kilometres (43,000 sq mi) and is home to about 4 million people. English is the official language and over thirty indigenous languages are also spoken within the country. Liberia is the only country in Africa founded by United States colonization while occupied by native Africans. For those interested in Marine and ships, the Liberian Registry, established in 1948 by former U.S. Secretary of State Edward Stettinius, is recognized as one of the foremost open ship and corporate registries. The Liberian Registry is a sovereign maritime jurisdiction responsible for the registration, regulatory enforcement, and safety of ocean-going ships. The Registry establishes identification details for ships and records legally enforceable documents, such as mortgages and bills of sale. The Liberian Registry – the second largest in the world – includes over 3900 ships of more than 131 million gross tons, which represents 11 percent of the world’s ocean going fleet. The Liberian Registry is recognized at the top of every industry “white-list” including the International Maritime Organization and the major Port State Control authorities. According to the U.S. Maritime Administration, Liberian flagged vessels carry more than one-third of the oil imported into the United States. The Registry is open to any ship owner in the world. In order to enter the Liberian registry a vessel must be less than 20 years of age and must meet high safety standards; Liberian flagged ships are able to trade anywhere in the world. There are no crew nationality restrictions and taxes on Liberian vessels are at rates based on the net tonnage. 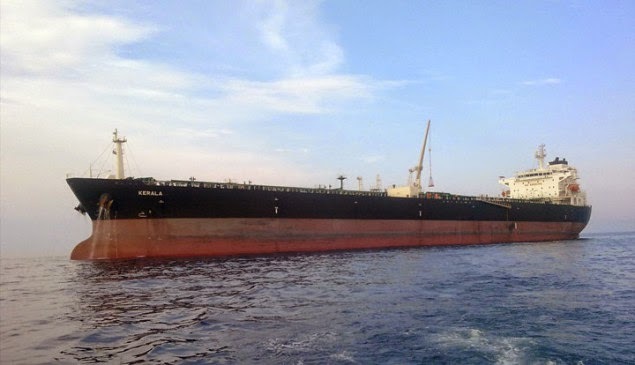 Now the news from Gcaptain……… the Liberian Registry has concluded its investigation into the pirate-hijacking of the product tanker off Luanda, Angola, on 18 January 2014. The Liberian investigation is based on evidence gathered by an INTERPOL-led multinational Incident Response Team as well as findings of its own investigative efforts. It states that the Liberian Administration is currently in the process of publishing its report into the hijacking of the Liberian-flagged vessel. Liberia requested the attendance of the INTERPOL Incident Response Team in Tema, Ghana, the port of refuge to which the vessel was directed following the disembarkation of the pirates. The team, supported and helped by the Ghanaian authorities, undertook a crime scene investigation on board the vessel. A representative of the Liberian Flag Administration also attended on board in Tema to observe the collection of forensic evidence by the authorities, and interviewed some crew members. All parties were given full access to the vessel’s documents, officers and crew. Upon arrival at Tema, Ghana, all crew members received immediate medical treatment and have since been repatriated. Following the hijacking off Angola, the vessel proceeded to Nigeria and the cargo was offloaded off the coast of that country by the pirates, believed to be Nigerian nationals. During the hijacking, the fourth engineer was stabbed by the pirates, and other crew members were beaten. The investigation report described the ordeal of the fourth engineer based on his account of the circumstances of the hijacking incident. It also revealed that, during the hijacking, the pirates disabled the vessel’s AIS and other communication equipment so that the vessel could not be tracked from shore or satellite. During this period, the pirates painted over the identifying features of the vessel, including funnel, name (and IMO number. The pirates also undertook three separate ship-to-ship transfers of cargo amounting to the theft of approximately 12,271 mt of cargo. Now continuing Gcaptain report - according to the findings, the owners/operators of the Kerala re-established contact with the vessel on 26 January 2014, shortly after the pirates had disembarked. The vessel immediately set a course for Tema, where a team of Angolan Navy personnel subsequently boarded the Kerala and ultimately directed it back to Angola. The vessel was cleared for discharge at Port Luanda on 19 February, 2014. Since then, a team of Angolan policemen have prevented embarkation or disembarkation of any person without permission from their superiors. The Kerala has not been allowed to depart Angola, even though it has completed cargo discharge operations. Liberia actively participated at the Joint Co-ordination Meeting of interested parties of the Kerala hijacking incident at INTERPOL Headquarters in Lyon in April 2014.